hit movie in 1988. Absolutely Fabulous! Events and Productions, Inc. is now the proud owner of the first Walking Piano® to be used on a portable, rental basis for special events. 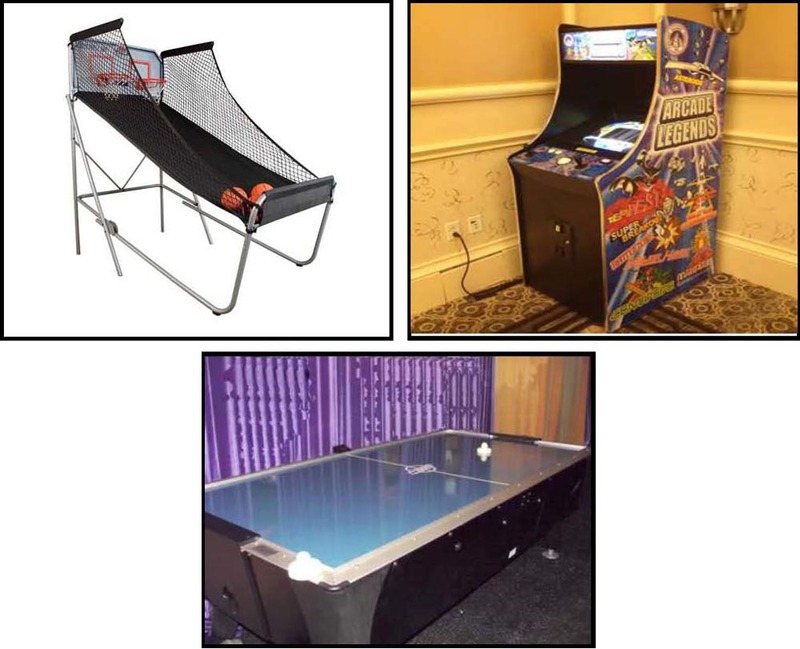 This can be used to entertain guests: during a reception/cocktail hour, around the perimeter of a ballroom, on stage for a CEO performance, or at a tradeshow to attract and keep attendees in the booth. This can be used for a “BIG”, “Eighties”, or musical theme. This will be the hottest new interactive entertainment this year. Be sure to confirm for your next big event soon. 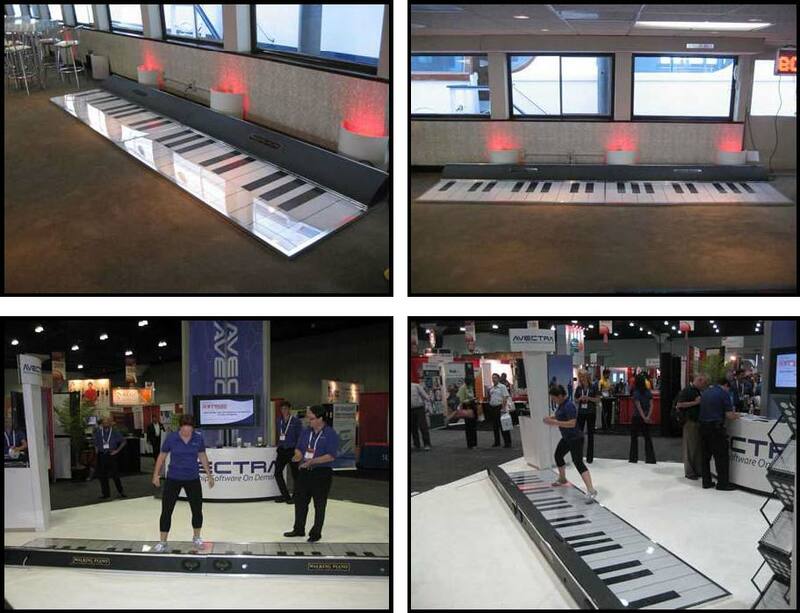 This is made of TWO separate pianos each about 4 ft. deep and 7.5 ft. long combining for a total length of 15 ft. When the two pianos are linked together, there are three full octaves of keys. Private instructions, training, and choreography will be available for additional fees. 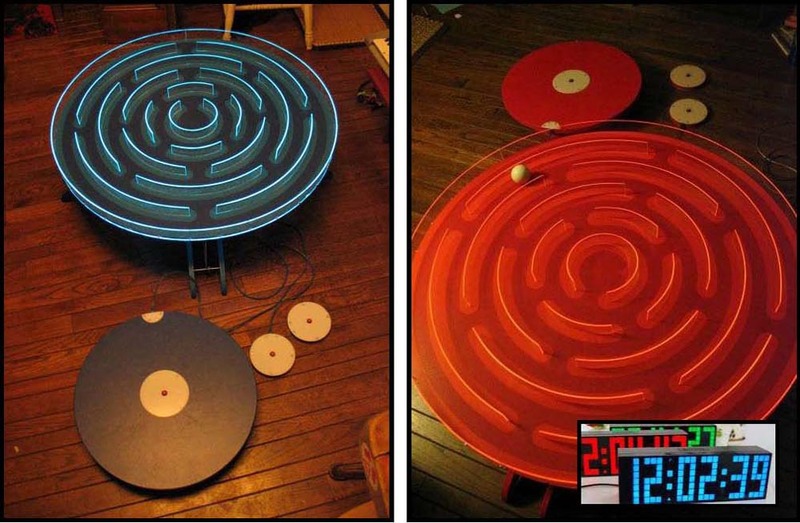 Tired of Xbox and iPad games….it is time to go “old school.” This newly designed (36” round) maze is modeled after the old children’s game: Fascination…but with a modern twist using Arduino controllers. There are three types of controller units that can be used to navigate the maze: a hand-held unit, a foot-balance board, and finally a cellphone/iPad app, although we don’t use this option as it really is designed as a hands-on activity. The maze walls are constructed with clear acrylic plastic…and they are illuminated with EL (electro-luminescent) wire. The small white discs are hand-held controllers and the larger painted discs are for standing on and controlling. You can compete against the LED stopwatch or against each other in head-to-head competition. 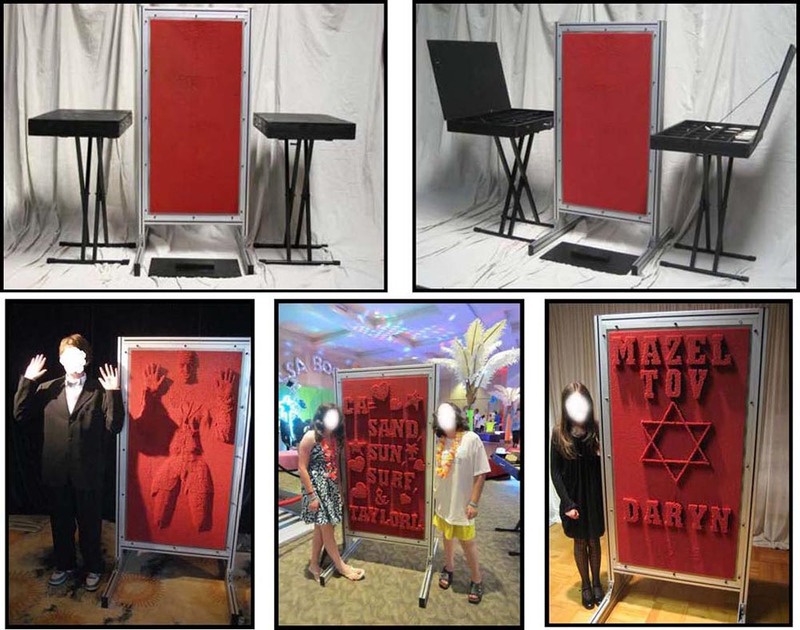 This is the first portable life-size Pin Art Wall available in the United States. Imported from Italy, there are over 110,000 non-breakable plastic pins in perfect placement for your entertainment. After each guest creates their own design, they can pose next to their creation and our coordinator will take a digital photo of each “artist” next to their sculpture. (Option) We can supply the printed photos in a generic photo jacket cover (custom is available). Our attendant/coordinator will reset the pins, in their original position for the next guest. Hours of fun can be created by people of all ages. Guests can safely press their face, arms, hands and other body parts against the pins, from the back side, and create their own Pin Art Sculpture. Additionally, we have created over 60 pre-built shapes to help the guests with their sculptures including: the letters A-Z, numbers 0-9, circles, squares, hearts, and many more shapes. The Set includes: the life-size Pin Art Wall, a fabric backdrop, and two cases filled with pre-built shapes. These cases of shapes are set up on our own stands for guest convenience. Treat yourself to the freshest ice cream experience available. We will literally make ice cream right before your eyes. This patented process uses fresh cream, flavorings, fruit, and mixings all blended in our industrial mixing bowls. By adding a blast of Liquid Nitrogen, at -320 degrees Fahrenheit, we actually freeze the liquid right there, creating the smoothest and freshest ice cream, in minutes, at your event. table, side and back tables covered in high gloss white patent vinyl tableform linens, and a LED illuminated standup table for assorted toppings. You will have the option of two customized distinctive ice cream flavors for your guests…served in plastic martini glasses…and a variety of toppings. For an additional charge, the station can be opened early to create NitroTinis (frozen Martinis) and other frozen beverage cocktails and we can work with your chef to create other interesting options. Welcome to our world of Jumbo Texting where these LED message screens allow silent communication during any event. Use one, two, three, or four signs so they can be seen from anywhere in the room or in adjoining rooms. Use these signs to help manage the event, offer personalized congratulatory messages, or flash custom trivia. Radio-frequency technology allows use in multiple rooms without connecting wires. Our three-color Jumbo Texting system has multiple uses and functions. use GREEN for trivia information about the company or the honoree. Finally, YELLOW is used to communicate messages from the guests which are texted to us from their phones. We provide a live on-site monitor who audits all the messages for content BEFORE the messages are shown on screen. Also, the monitor can add handwritten messages from guests who are not tech savvy. If you want to update most LED signs…you have to turn the signs off to update the programming, but with our software…the messages can be edited on-the-fly without interruption. Communicate your messages, agenda items, or let your guests have all the fun by JUMBO TEXTING at your next party. A new addition to our AbFab Fun&Games unique interactive activities is our on-site TRADING/BASEBALL CARD photo system. At your event, we take photos of your guests…as is…or accented with props (hats, caps, helmets, baseball bats and gloves, briefcases, laptops, etc.) and print them onto cardboard stock just like real Baseball Cards. Working with your guests, we custom design the back of each card to include their relevant information. business/trading card for each guest. Each guest walks away with a minimum of (25) personalized cards that they can start trading immediately. thicker than traditional Baseball Card stock. Other companies may print simulated cards on photo paper but nobody currently replicates the true baseball card thickness, with printing, on site, at your party. This special printer is designed to allow the cardboard to pass straight through during the printing process, which cannot be done with traditional printers which have a series of rollers. This is a very simple hands-on experience. We design and create a wooden template to commemorate your event. At the event, your guests each create their own artwork using our paper, paint, and roller system. The guests can take their artwork home as a souvenir of the event. The other option is that your guests can write personal notes or messages to the honoree/s on their artwork. All of these individual papers can be bound into a book as a lasting keepsake as an alternative to a traditional sign-in book. 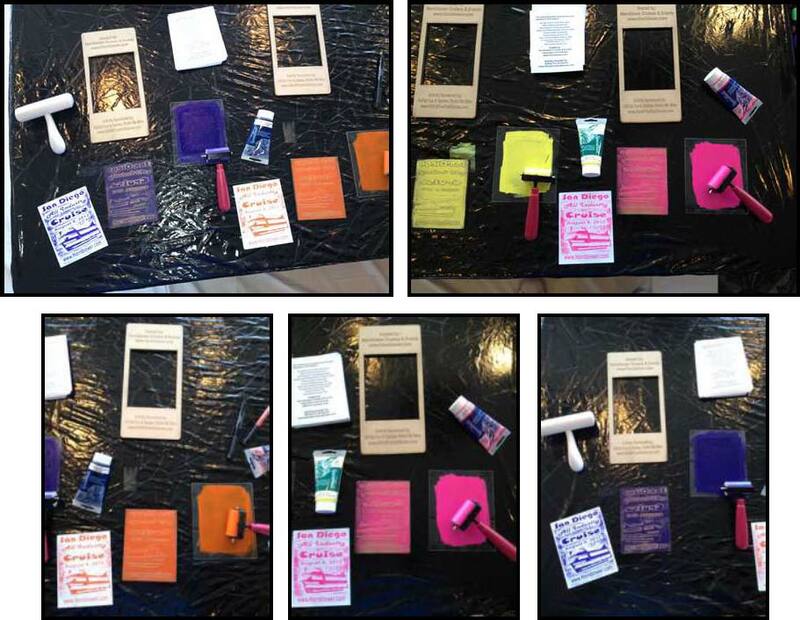 This is another AbFab Fun & Games hands-on experience. Following directions provided by John Collins, The Paper Airplane Guy, guests fold and create their own paper airplanes. 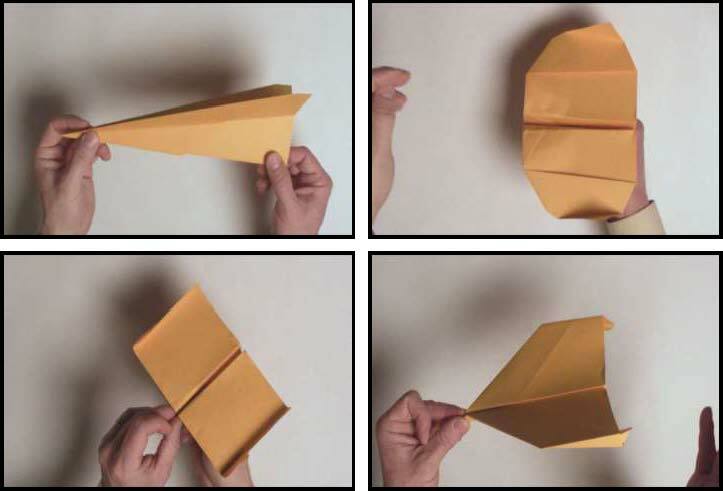 Different types of planes and different types of folds allow the airplanes to behave differently, in flight. We will place large storyboards, on easels, showing the simple steps to create a paper airplane, we will provide paper of varying weights, and tools that experienced paper airplane crafters use and then we will have contests to see which plane and which operator perform the best. There are four separate contests: longest flight distance, longest time in flight, best accuracy, and best control. The first two contests are simply measured by distance and time. Best accuracy will use trussing towers with a variety of hoops attached and the guests try to get their planes to fly through the hoops…scoring the most points for passing through the smallest hoop, etc. Best control will require the operator to throw the airplane past a trussing tower, make a hard right or left bank, and land closest to the hoop on the ground. Winners in each contest receive a book on making paper airplanes written by John Collins. might lose half of your guests to this activity. The shooting gallery is designed at a maximum 14 ft. wide, 20 ft. deep, with 10 ft. high black pipe and drape protecting the surroundings. We use a regulation 4 ft. x 6 ft. wide goal and rubber balls. 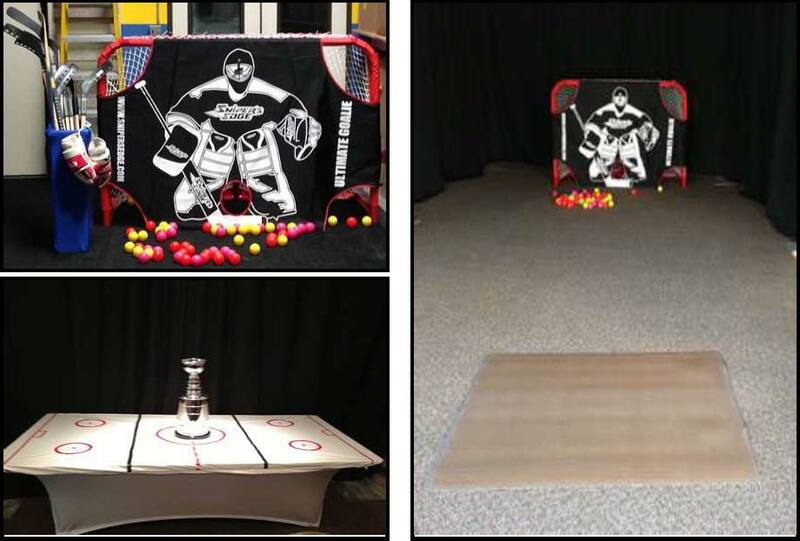 There is a heavy duty ballistic canvas “goalie” used to increase sharpshooting skills for hockey players. In our competition…each guest takes ten shots and scoring is as follows: 1 point for the low corners, 3 points for the high corners, and 5 points for between the goalie’s legs (called the 5 hole). We track the scores and include a leader board. If desired, prizes can be awarded for the person with the most goals and the person with the most total points or other categories. Game on. 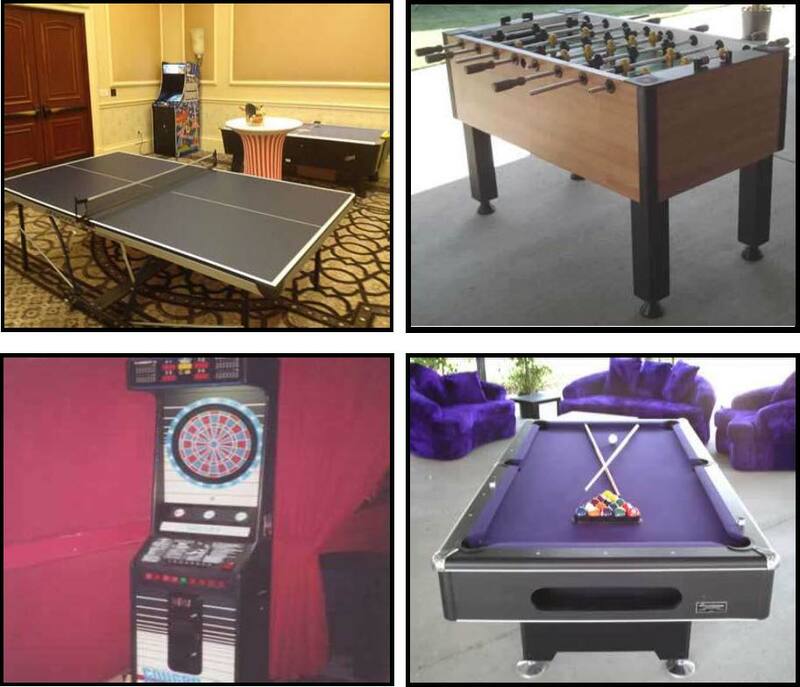 We have a small inventory of all the traditional games: ping pong, foosball, electronic dartboard, and, of course, pool tables. However, even our pool tables are not traditional in the sense that they are covered in purple, red, or pink felt. Two of the most popular tables are covered in black felt and have leopard fur covered rails. 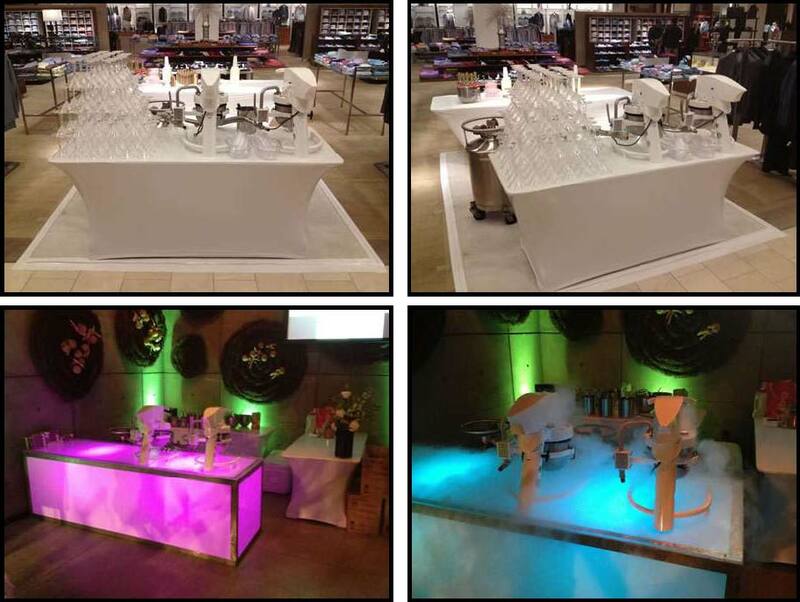 These two tables are especially popular with our Rat Pack Theme Party. screens, or candy bar station for those late night snacks. Missile Command, and Centipede just to name a few. We also have replicas of the original Atari game console. This is used in a lounge setting with a loveseat, coffee table, and flat screen LCD monitor. Two players can compete at this game station. Learn a little science and have a little fun in this hair-raising experience. We create a very unique photo op using a Van de Graaff generator. This device creates a high volume of static electricity which creates all kinds of magic when your guests interact with it. Our staff is present to make sure your guests have a fun, unique, but safe experience. We are also there to capture the fun on camera and print a souvenir photo for your guests to take with them.